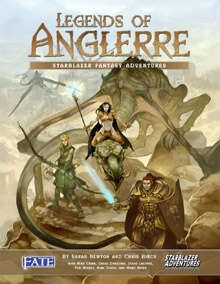 The Legends of Anglerre RPG (LoA) by Sarah Newton and Chris Birch takes the Starblazer Adventures iteration of the FATE 3.0 system and adapts it for the fantasy genre. This game strives to cover multiple subgenres in the fantasy milieu, with the focus on the Moorcockian swords and sorcery setting of Anglerre, and the high fantasy Hither Kingdoms. The source material for this game is drawn from a series of British comics that appeared in the Starblazer Adventures comic books. References are made to various characters and events from the comics and can at times leave the reader a bit in the dark. The physical book itself is an impressive tome at just over 380 pages. The cover is full color and depicts three adventurers posing dramatically in a ruined building. The interior of the book is predominantly black and white with the sidebars offset in parchment colored boxed. The artwork is predominantly drawn from the LoA comics. Art is a very subjective topic and while I do not care for the style of art in this book, I do applaud the consistency of the artwork to present a unified vision of the setting of Anglerre. In the Legends of Anglerre character creation and system discussions are intertwined within each chapter. In this review I shall untangle them and initially deal with character creation. In this game character creation is a very collaborative process between not only the players but the GM as well. In many RPGs game play does not begin until the players gather together with characters typically created separately from each other. This leads to the clichéd starting scene in a tavern/bar/other public meeting place and the PCs joining together for sake of the plot. In LoA actual play begins at the start of character creation. This facilitates a collaborative process between players and the game master (GM) and proves advantageous as it allows the players to have input in the direction of the game and they provide plot ideas and potential stories for the GM to use. The first step in character creation is establishing the character’s concept. The basic power level of each character is determined by the rating of the peak skill they posses. Each of the power levels (there are three discussed in the book grants a number of aspects, phases and skill points to create the character, and beyond these levels of power there is a chapter dedicated to epic and mythic games later in the book. The number of stunts affects the refresh rate of fate points a character receives between sessions. The role of fate points will be discussed in the Game section below. The next step is to move through the phases of background creation. The number of phases each character has experienced varies dependent on their starting power level. Each phase adds depth to the character by granting aspects (descriptive qualities that are applied to characters, objects or locations, discussed in more detail later in this review), and some phases will establish ties to other characters thereby creating some kind of narrative logic as to why the characters are helping each other. I have found this method of character creation to be extremely useful as it drastically cuts down on the brooding loner archetype, or it compels the player to somehow integrate the character into the group. The first phase is a general background, describing the character’s life until adulthood. The second phase is the first legend (i.e. adventure) the character starred in. In the third phase the ties between the characters are established by having one player contribute how their character played a supporting role in another character’s story from phase two. The fourth and subsequent phases are identical to the previous phase except the player must choose different characters’ legends to costar in, or add an additional legend. When all phases are completed each character will have ties to at least one other character before play even begins. After completing the phase portion, character creation moves to the more traditional style of character detail: skills, powers and stunts. Skills in the FATE system are rated using a ladder that is the core of FATE. The ladder is a number line ranging from -3 to +8 and each number has an associated adjective, e.g. Mediocre (+0). The rating of Average (+1) is for a skill that a character performs regularly and professionally. All skills default to a rating of Mediocre (+0). The number of skill points available is dependent on the power level of the game as established by the GM. The maximum rating in a single skill at character creation is also limited by the power level of the game ranging from Good (+3) for characters just beginning their careers, to Superb (+5), highly competent, characters. Raising skill levels is a simple matter of spending points on a one to one basis. The only trick is that each skill level must have at least one more skill than the level above. The book provides some examples of point distributions to satisfy this skill pyramid. For example, in a lower power game each character would have 15 skill points, and could spend them to buy: 1 Good, 3 Fair and 6 Average skills. Skills and powers are handled identically, with the only difference being skills are mundane in origin and powers are supernatural. Each skill or power provides access to stunts which can be selected by any character and provide situational modifiers to a skill roll. An entire chapter is dedicated to stunts and provides a list of examples, sorted by skill modified, and in-depth guidelines for designing stunts. Powers reflect abilities that exceed normal human capabilities. These skills and their associated stunts can be used to emulate magical spells, divine powers, or supernatural abilities of monsters. Like mortal skill stunts, powers are detailed in a separate chapter. This chapter provides a short list of special abilities and the grouping of stunts by general theme, e.g. powers of Nature. Once skills are chosen the only tasks remaining are to establish the refresh level, by adding up all of the character’s stunts and subtracting them from the initial refresh level of ten. Each character begins with a number of fate points equal to their refresh level. The LoA also provides options for faster character generation as well. The minimal preparation method skips the phase portion. In the on the fly method, players begin with blank character sheets and fill them in during play. Of these two fast methods I prefer the on the fly method as it maintains the idea of collaborative creation of the phased method where the minimal preparation method would result in the more clichéd band of misfits method of meeting. A final piece of helpful advice is included in LoA for players that are stuck on creating a character or for players who enjoy a bit of randomness. There are a series of lifepath tables covering the major details of a character’s background. This would be very useful especially for a new player who could suffer from the paralysis of too much choice. In addition to the creation of characters LoA allows players and GMs to create other story elements, e.g. items, vehicles, buildings and nations, using the same basic method use to create player characters. This is one of the major strengths of the FATE system and used to great effect in LoA. The types of items covered range from non magical devices, traps, magic items, to magical creatures. Each type of item is given a list of improvements that may be applied. Characters may acquire these items in two ways, either at character creation or through play. Stunts are used to obtain these items at character creation, but the stunt does not impart plot immunity to the items, that can only be obtained through using an aspect to define the item in addition to the stunt. The creation of special items are detailed as well with each major item type receiving a description of how it is to be made. There are other interesting methods of creating or obtaining these magical items as well. They can be developed during play through character actions or plot stresses, where a character using the item to fulfill its purpose can unveil different or more potent abilities. The Legends of Anglerre uses the FATE 3.0 system created by Evil Hat Productions. The FATE system uses a dice pool and target number to determine the success of actions taken by characters. Unlike the vast majority of other RPGs, the FATE system is designed to be used with special dice. These dice were originally used with the FUDGE system, which FATE is based on. The dice are six sided and have two plus signs, two minus signs and two blank faces. The dice pool is always made up of four dice and the operators are added together giving a result between -4 and +4. To this result is added any bonuses from aspects, skills and stunts the character can apply. This total is then compared to the difficulty set by the GM. If the total exceeds the difficulty the character succeeds and for every point over the difficulty a greater degree of success is added, which in LoA are called shifts. FUDGE dice are fairly difficult to obtain as they have not been produced in several years. In LoA a simple workaround is proposed in rolling d6-d6. This gives a bit of a flatter probability curve and can lead to more dramatic successes and failures, which fits the tone of the game quite nicely. All difficulties are measured on a single scale called the ladder. This scale is both numeric and descriptive in nature, for example, a character may have a Good (+3) rating in Discipline. The ladder is also used by the GM to set difficulty numbers. The primary way a player can influence the outcome of the die roll is through the use of aspects. These are descriptive qualities that are applied to characters, objects or locations. Typically they describe some permanent (or more rarely, temporary) feature of a character, object, or location. It is through aspects that the character acquires and spends fate points. Fate points are used to apply the bonuses inherent in aspects or supernatural powers and avoid unwanted complications in the game. In the chapter dedicated to aspects there is a short list of sample aspects mainly to provide inspiration for players and GMs. Also included is advice on how to create aspects that help shape the story the character is involved in, with several examples of good aspects and how to improve them to include advantages and disadvantages. LoA also places an interesting twist on aspects through the use of, future aspects. These aspects represent long term goals for the characters and can be used to generate a character plot stress track, which is similar to a general plot stress track. There are several ways aspects are used in the game: invocation, invocation for effect, compel and tag. Invoking an aspect is where a player uses an aspect to gain an advantage, and if ruled applicable by the GM then the player can spend a fate point and can either choose to add two to the die roll, or to completely reroll. Invoking for effect allows a player to make a statement about the game that becomes true, with beneficial statements costing a fate point to invoke. Compelling an aspect is where a player, and more typically the GM, uses a character’s aspect against them. The main outcomes from a compelled aspect are either limitations to a character’s response or adding complications to a situation. The exact terms of a compel, like an invocation, can and should be negotiated between the group so as to avoid blatant abuse. The character receives a fate point when an aspect is compelled, and can opt to avoid a compel by spending a fate point. Compels are not entirely negative as they are used to drive the story and make it more interesting and since aspects are created by the players these should be problems they are interested in playing through. This mechanic is an excellent way of keeping characters involved in the story and making sure the story remains interesting to the players. Aspects are predominantly a permanent part of whatever they are attached to, but temporary aspects can be created through events in game. The most common way a temporary aspect is applied is through the use a maneuver, which is an action that applies an aspect rather than directly hurts the target. These aspects come in two varieties: fragile and sticky. Fragile aspects are gained when a maneuver roll gains zero shifts, and the aspect can be then tagged once and it goes away. A sticky aspect is applied when the maneuver roll gains shifts and can be tagged without disappearing. A target of a sticky aspect must perform their own maneuver to rid themselves of the aspect. Tagging an aspect is a special type of compel that a character can use without spending a fate point. Aspects need to be known to a character before they can be tagged or compelled. The surest way to discover aspects is through assessment. This typically involves research by the character and after a successful skill check will allow a character to be able to tag the assessed aspect when appropriate. A quicker way to discover an aspect is through guessing, by spending a fate point a guess can be made about an aspect and if it is reasonably close then it is revealed and tagged. Declarations split the difference between a guess and assessment as they allow a player to introduce an entirely new aspect to the scene, by succeeding on a skill roll. While aspects define who a character (or place) is, skills define what they can do. Skills in the FATE system are the direct measure of a character’s abilities to accomplish various tasks. The rating of a skill is added directly to the die result to determine success. In LoA there is a fairly short list (27) of skills, as each of the skills are fairly broad each one has a set of subsystems, called trappings, that explain how certain skills apply in specific situations. Power skills can be subject to different sets of limitations than mundane skills in LoA. These limitations are presented as being optional and any or all of them can be applied depending on the requirements of the setting. This is an excellent design decision as it allows groups to tailor the workings of magic and will impart different feels on each campaign, and avoids a pitfall of some generic rules sets where all of the magic systems feel the same. All of the power skills as listed have very basic effects, typically taking little time to cast, affecting one nearby target. In the section dealing with power skills there are a variety of manipulations that may be applied to the base effect. For example, more time can be taken to use the power granting a bonus to the roll, or a penalty can be applied allowing the character to affect multiple targets. Unfortunately these manipulations are not in the same chapter as the power skills themselves and can require a bit of hunting through the book to find them. Conflict resolution at its most basic revolves around inflicting stress on opponents and striving to take them out of the fight. Opposed rolls are made and if the attacker wins stress is inflicted and if the defender wins the attack is unsuccessful. Several common situations that occur in physical confrontations are presented including blocking, grappling and maneuvers. Unlike most RPGs, the FATE system does not rely exclusively on physical confrontations resulting in the death of one of the combatants. Each character in the game has two stress tracks: physical and composure. These tracks represent how much punishment a character can take in a given encounter before being “taken out.” The physical stress track is used primarily in combat situations where physical injury and character death is the goal. The composure track can be used during debates or other non violent conflicts of interest, where typically being “taken out” is the loss of the argument. Each track consists of a number of boxes (dependant on the skill associated with the track) and are marked off as stress accumulates. Characters can reduce the amount of stress taken by suffering consequences. A character can take one consequence in each of the four severities: mild, moderate and severe. Minor consequences last until a character can rest for a few minutes and cancel a small amount of stress. Major consequences last for several hours to days of in game downtime and cancel more stress. Severe consequences cancel even more stress and last for weeks. Extreme consequences remove the most stress and need powerful in game magics to remove, and even then can still result in permanent new aspects. Another type of stress is available for the GM to use to move events of the story along without the feeling of powerless railroading by the players. Plot stress is a stress track which, has a variable number of boxes, gets checked off when the PCs take certain actions and when specific thresholds are reached significant plot elements come into play. Like other stress tracks the PCs can opt to take consequences to mitigate plot stress as well, creating interesting situations for the characters. Anglerre is the default setting for this game; it is a swords and sorcery setting inspired more by Moorcock than Howard. Anglerre itself is a kingdom of “stoic, salt-of-the-earth people” at near constant war with the neighboring kingdom of Suvethia, a kingdom of wizards. Magic in this setting was introduced by an ancient race and is seen by Anglerrans as something to be suspicious of. The chapter introduces the various kingdoms and peoples of the setting. Included in each description are a short list of typical aspects, occupations and gear of each people. This is very helpful for both players and GMs that may not be familiar with the source material. A gazetteer follows detailing various places, including locations beyond the physical world, i.e. other planes of existence. Lastly is a list of key figures in the setting with brief descriptions of each. The brevity of this chapter is not a detriment to the setting, as most swords and sorcery setting are developed in less detail than high fantasy settings. Also this allows groups to add what details they wish and put their own mark on the setting and, coupled with collaborative campaign building, increase the sense of ownership of the setting. The Hither Kingdoms is a high fantasy setting drawing predominantly from Tolkien and Lewis. A thousand years ago a shining alliance of men, elves and dwarves fell and only the city of Selantium remains as a bastion against the tides of darkness. Rather than the human centric Anglerre, the Hither Kingdoms have all of the typical fantasy races of humans, elves, dwarves and little people, with some new additions as well, namely wilderlings (sapient animals) though they satyr race from the character creation chapter could be included as well if a group wanted a bit more Lewis influence. Various types of magic are covered ranging from natural magic of the elves, priestly magic to sorcery, or “black magic.” Where there is priestly magic there must be gods and a short pantheon is introduced with a few example deities. This once again allows groups to tailor the setting to their specific tastes, and many gamers are fairly familiar with the deity archetypes. Similar to the Anglerre chapter a short cosmology and key figures are introduced as well. Chapters full of guidelines and advice for GMs are concentrated mainly in the second half of the book. A particularly stand out chapter is the one on epic and mythic gaming. The default competence level of characters in LoA is within the range of human ability. This chapter allows groups to run games that go beyond that level. Epic gaming is centered on setting shaking events and characters that are larger than life. Mythic gaming is focused more on interactions with otherworldly creatures and powers. These options open up whole new vistas of play at the start of a game rather than having to advance characters up to this level. Complementary chapters include the one discussing world building and another, albeit very short, on collaborative campaign creation. Several chapters include sample characters, items, domains, etc. that groups can use in play or refer to as a guide in creating their own for the game. Obviously while there is no one right way to play a specific game, I do find the inclusion of examples in these more open rule sets to be very helpful, in that they provide some idea as to what the writers intended as the feel and tone for the game. This allows a better fit of a system to a particular game, avoiding the issue of the rules interfering or limiting the type of story or characters that can be portrayed. The bestiary chapter has a fairly standard array of high fantasy creatures with the inclusion of ones from the Anglerre setting. Unfortunately no real distinction has been made as to which creatures are specific to Anglerre, and as a GM who is not familiar with the comics this would have been helpful. Legends of Anglerre RPG not only succeeds at its goal of providing a rule set so groups may play in the Anglerre setting, it leaves enough generality to the rules allowing groups to tailor this game to any type of fantasy setting imaginable. In using this twofold method of presentation, LoA avoids the pitfall of many universal systems in being fairly bland in tone. This game is also one of the few out there that can honestly claim it is complete in one book. The only criticism I have of this game is the organization of chapters is a bit haphazard, and is compounded with a less than complete index. This is mitigated a bit by the inclusion of rules reference sheets at the end of the book.